Much of the best mining in Eve is done in null – but not just any null – in null space owned by a sovereignty(sov) holding alliance. What this means is that alliance takes over space which is either unowned or owned by someone else and installs system structures called a Territorial Claim Unit (TCU) and/or an Industrial Hub (IHUB). 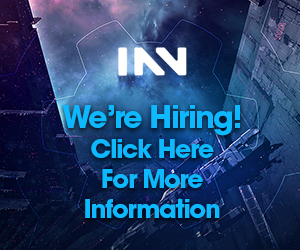 For mining purposes, the important structure is the IHUB, as it is what allows the improvement of a null system so that mining anomalies spawn. One of the mechanics of null sov is the Activity Defense Multiplier (ADM). This is a measure of how hard it is to take a system away from the current owner and is made up of three indexes. The first is the Strategic Index, which is an indicator of how long the alliance who owns the system has owned it. The second is the Military Index which is an indicator of how many NPCs have been killed over time in that system. The third is the Industry Index which reflects how much mining is done in the system. Note: an IHUB must be installed in a system for the system to benefit from raising of indexes. These indexes have multiple purposes – together they comprise the Activity Defense Multiplier(ADM) of the system and the higher the ADM the longer it takes for an attacker to take the system and the harder it is to take. This website can help illustrate how indexes influence the ADM and how increasing a system’s ADM makes it more difficult to attack. The index we are concerned with in this guide is the Industry index. There are 5 levels of the industry index and get to each level a certain amount of mining needs to be done. 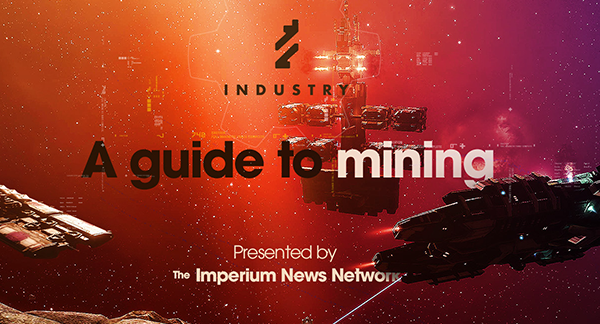 In order to get to Industry index 1, only a small amount of mining is needed, but the amount of mining needed to progress through the indexes increases per level. The Industry index also decays at 1% an hour, so there is a certain amount of mining per day that is required to maintain any index level. The table below shows these levels. The usual progression is mining in the normal asteroid belts to get the industry index to 1, and then installing the IHUB upgrade. IHUB upgrades are required for the nullsec ore anomalies to spawn. Once the industry index is level 1, you install the Ore Prospecting Array 1 into the IHUB, and as long as the index is above 1 after downtime, the Small Asteroid Cluster will spawn. This is the smallest mining anomaly. When you get the industry index to level 2 and install the Ore Prospecting Array 2, the Medium Asteroid Cluster will spawn. Level 3 is the Large Asteroid Cluster. If the system has a truesec of -.46 through -.85, you will get the +5% ore variant asteroid cluster – the Large Potent Asteroid Cluster. If the system’s truesec is below -.86, you can spawn the Large Rich Asteroid Cluster which has the +10% ore variants. 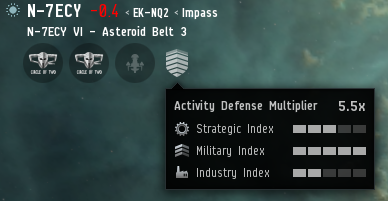 The +5% and +10% ore variant asteroid clusters spawn in the appropriate truesec systems for the level 3, 4 and 5 index/upgrades. Level 4 industry index spawns the Enormous Asteroid Cluster, and level 5 spawns the Colossal Asteroid Cluster. Mercoxit also spawns in the Large, Enormous, and Colossal asteroid clusters. The Colossal Asteroid cluster is the largest anom and has the most abundant rocks with the most ore in them and takes a good bit of mining to clear out, but the best feature of nullsec sov for mining is that when you mine out the last rock in an asteroid cluster, the cluster respawns within approximately 5 minutes. This allows you to move to the new cluster and keep mining. You don’t need to wait for an asteroid belt to slowly fill up again, it pops in brand new and pristine. On the other hand, keeping the Industry index above 5 requires a large volume of mining per day, and is thus unlikely to happen if there are only one or two miners spending a few hours a day on mining. Rorquals are the endgame of mining. With the Ascension expansion and the introduction of the ‘Excavator’ Mining Drone – Rorquals have become the highest yield miners in the game. Capital ships possessing jump drives and a 10LY jump range, they can travel quickly to ideal mining spots and use their drones to harvest ore (or ice with the ‘Excavator’ Ice Harvesting Drone) in vast quantities. They are able to fit a capital size tank as well as the Pulse Activated Nexus Invulnerability Core (PANIC) module – a module that makes the Rorqual and all industrial ships within 200km invulnerable for between 5.5 and 7.5 minutes. Rorquals also feature unparalleled mining boosts for subcap mining ships. Please note: The PANIC module requires the Rorqual have an asteroid targeted in order for the player to activate it. Also note: The PANIC module from one Rorqual does not make other Rorquals in range of it invulnerable. Each Rorqual must use its own PANIC module. Despite the recent nerfs, Rorquals are still able to mine over twice that of a max yield Hulk. Rorquals are an expensive investment to put in a belt and siege – and despite having the PANIC module available to equip, plenty of Rorquals die every day so a decent fit is important. Fitting a Rorqual is not for the inexperienced. Due to the wide range of uses for it, it can be fitted in a large number of ways. Additionally, because you are immobile with your industrial core running, you should ALWAYS have a mobile depot next to you to swap fitting on the fly as needed. As a result, it is easier to break down Rorqual fitting between the high, mid, low and rig slot groupings. Mining Booster – This is a common set up which can be used when you or others have mining barges/exhumers on the field. However, mining link boosts have ZERO affect on mining drones; therefore, if only industrial command ships are present this isn’t a good set up. Also if none of the barges/exhumers are using T2 mining crystals (ex. T1 stripminers or any Ice harvesters) there is no need to run the “Mining Equipment Preservation Charge” as it only affects Ore Mining Crystals. Max Tank- These are good fits you when you know hostiles are incoming. You never know how long it will take for back up to muster and jump to you. If your enemies get a cyno inhibitor up you will need every minute of tank you can get. Fit A is set up as a self-shield booster, fit B is set up to take more advantage of raw hitpoints. Your tank fit on the Rorqual should be your base that you always have. However once in the belt, you can modify the fit to suit your needs by swapping in following modules. Drone Navigation Computer (any) – Increase ore yield per hour by allowing more trips for your drones. Installing more than one is not recommended as the loss in tank fitted is substantial compared to the minimal increases in yield. Survey Scanner (any) – Due to the fact the Rorqual is locked in place with the core on you don’t want to be left mining a rock that is almost gone. Recommended to remove once you have scanned nearby rocks. The Rorqual scanner range bonus will easily scan every rock around it while in a belt. 500mn Microwarp Drive (any) – The Rorqual has the agility of a cargo ship. Cycling this module one time will allow your rorqual to go to warp in about 10 seconds. Without it the rorqual can take up to a minute and a half to enter warp. Capital prop mods will also work HOWEVER they have 15 second cycle times as opposed to the 500mn 10-second cycle. Max Tank – This low slot configuration can be paired with the one above at a bare minimum. If you’re unfamiliar with fitting on the fly and or addressing hostiles it’s a solid base to start from. Surprise Fighter – One of the most overlooked aspects of the Rorqual is its drone bonus from the industrial core. With the core running all combat drones have double the hit points and DPS along with a 30% boost to velocity. As a result with this setup, a single Rorqual is capable of putting out over 1300 DPS with Ogre II’s. Combine with multiple Rorquals and you can throw some serious punches at an enemy fleet. Max Yield – This is pretty much the only option for rigs on the Rorqual (with one exception later). This is not because nothing fits but because the Rorqual is designed to mine faster than anything in the game. Even with just T2 mining drones, nothing competes with it.There really isn’t a reason to not take advantage of this since it will increase your drone mining yield by over 50%! Fitting additional tank is an option, but the Rorqual already has the tank of a fax. Chances are if you need tank in your rig slots you’re dead already. DO NOT USE THIS FIT FOR RORQUALS IN THE IMPERIUM! Not all individuals have the benefit of having several thousand allies on hand in the event of an attack. One of the great misconceptions is that Rorquals are not useable outside of major coalitions. This is not true at all. Most do not take into account the rorqual mines ore faster and provides better mining boosts than any other ship in the game BEFORE the industrial core is activated. That being said, when using the Rorqual without backing one can use a fit similar to the following. While this fit is odd by coalition standards, there are several key reasons why it is fit the way it is. To begin with, you will not be turning on an industrial core. This allows you to align out while mining so that when hostiles come you can escape almost immediately. The Higgs rig will lower the velocity needed to enter warp allowing you to move slower while you mine, and to enter warp quicker, should you need to. Since you are moving though, you won’t usually have the benefit to refit so you’ll need to have a decent jack of all trades fit hence having the drone damage amps and inertia stabilizer in the low. You’ll only do about 750 DPS, but it’s still enough to possibly kill a tackler before his fleet arrives. The high slots are set up assuming there are other ships in your fleet or possibly other Rorquals. Some would argue against even having P.A.N.I.C. module since you have no fleet support but if it comes down to it sometimes just activating it can make a small fleet leave not knowing who you might have coming to help. How not to die in a Rorqual is much the same as how not to die in other mining ships – be in the standing fleet, be in comms, have a cyno, pay attention to intel (Survival in Null-Sec). A few other points to note – much of the value in the Rorqual is in the excavator drones – which are particularly vulnerable. Having a ‘Wetu’ Mobile Depot in your cargo hold and putting it down before you start mining at each rock and picking it up before you move is particularly smart as it has enough space for you to put all of your excavator drones inside of it if you get attacked. You cannot put it down safely after you have been attacked because the mobile depot is vulnerable before it anchors – if it is shot then it can be killed, but after it anchors it will enter a reinforce timer and you can save the drones inside of it. If you have it anchored before being attacked, you can put your drones inside of it and should you die, you will be able to recover at least that portion of the worth of the Rorqual setup. Rorqual drones are tasty targets as with the Ascension expansion they now give killmails and people will hunt them for those killmails and to upset miners in general. The ‘Excavator’ Mining Drones are also very susceptible to rats – they do not have a great deal of health and they are quite slow. If you are sitting a good distance off the rock you are mining and the drones start being attacked, it is a possibility they could be killed before they can travel back to you when you recall them. Please note: You are able to rep your drones – it is an excellent reason to have a remote shield booster equipped in a high slot. One main difference between Rorquals and subcap mining ships is that Rorquals have the Industry Core – and having it active is the same as being sieged. You are unable to warp/jump out or receive remote reps. This makes the PANIC module all the more important – it can protect you while your siege cycle ends. Multiboxing is the natural end game of any miner’s progress. 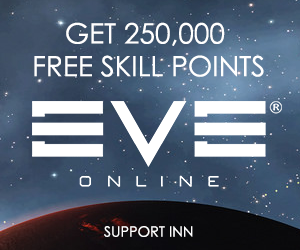 Mining, more than nearly any other activity, benefits from the n+1 nature of Eve online. The more miners you have, the more valuable dedicated support like boosting or hauling becomes. The number of clicks per minute you need to properly operate a miner (particularly in null-sec) is very low, so the number of miners you can operate is only limited by your computer power and ability to PLEX accounts. As such, anyone looking to make mining a dedicated part of their gameplay should understand Multiboxing. Before diving into constructing a multi-box setup, there is an important rule to remember. DO NOT use input broadcasting. (software that replicates clicks on one Eve client onto other clients). 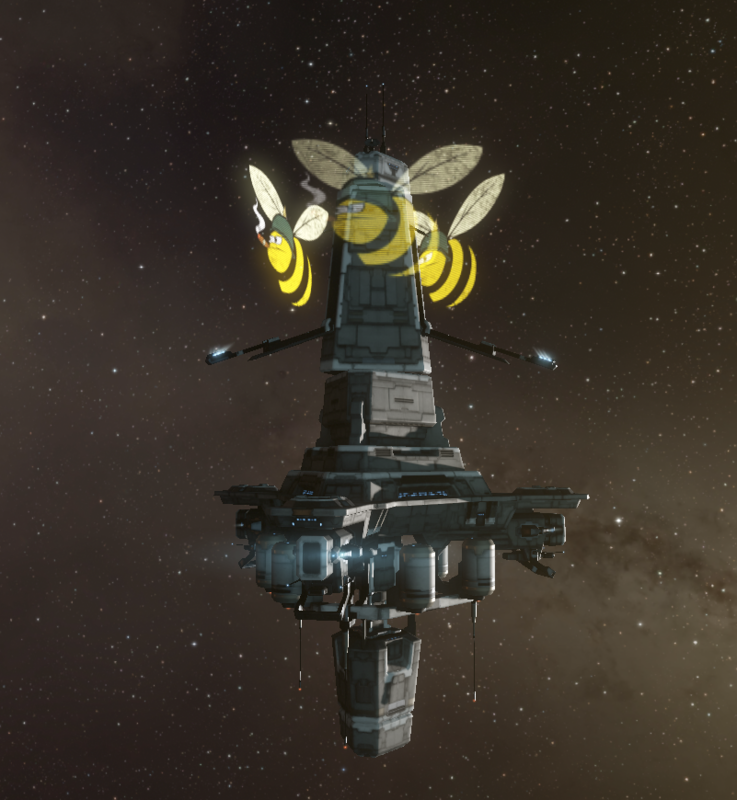 A few years ago, input broadcasting was allowed in Eve online, and players operated 30 even 40+ man fleets of mining barges, and guides for these broadcasting setups are still floating around the internet. Input broadcasting is now banned under the Eve EULA, and will result in all your miners receiving a suspension, and if caught a second time, a ban. A more recent interpretation of the EULA was announced in a dev blog in February 2016 and prohibits cutting out part of one client’s window and overlaying it onto another. Showing a thumbnail of the entire window still appears to be allowed. When you first begin multi-boxing, it is unlikely that you’ll start by operating dozens of accounts. The easiest method of multi-boxing is to simply set your eve client to windowed mode, and resize your window to fit two different clients side by side. This is perfectly acceptable for 2 different miners, and might be feasible up to 4 accounts if you have two screens, but beyond that you’ll want specific software to help with the multi-boxing process. There are two major pieces of multi-boxing software for Eve Online. ISBoxer and EVE-O Preview. 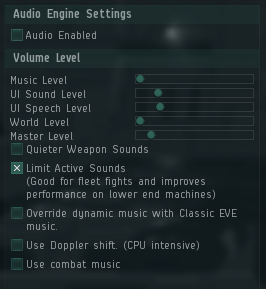 For mining I’m a strong advocate of EVE-O Preview. ISBoxer has more features, a more customization screen layout, and automates performance tuning for large numbers of clients. However, there are two major downsides. Firstly, the setup for ISBoxer is much more complicated, particularly if you want to do more than just the basics; and secondly, it costs money, whereas EVE-O Preview is free – a strong incentive unless you really need those extra features, which for mining, you do not. On the other hand, when one starts multi-boxing a larger number of clients, ISBoxer offers features that reduce the load of each client on your computer by limiting fps on clients in the background. EVE-O Preview provides scalable thumbnails displaying of each of the different Eve Clients currently running which updates in real time. Clicking on these thumbnails brings that Eve client to the forefront of the screen. This allows you to stack clients on top of each other and still keep an eye on all your miners in space, quickly accessing them if they come under attack or the asteroid they are mining finishes. Start off by downloading EVE-O Preview from the Eve Online forums, unzip the download and then install the program. Everything is very self-explanatory, but check the readme and forums in the unlikely event you have any problems installing. 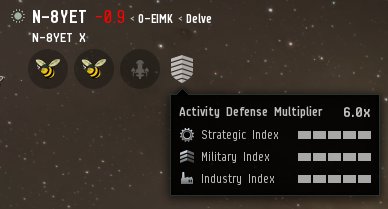 One of the important parts of multiboxing is optimizing your eve client(s) to allow you to run multiple instances of Eve on your computer. In Eve slang this is generally referred to as “potato” mode. 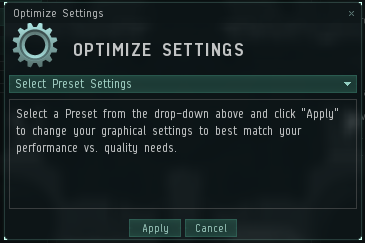 There are two important parts of optimizing your client for multiboxing – video settings and sound settings. 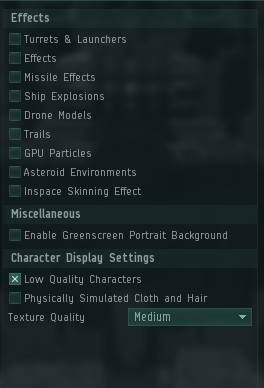 Then go to the Effects column and unselect all the tick boxes except Low Quality Characters. In the Display column – Windowed mode is almost mandatory for proper multiboxing. 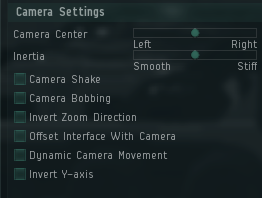 The Camera Settings section is a bit based on preference, but generally one would have it all deselected. Another relevant section is Audio – simply deselect the Audio Enabled tickbox and you are done. The last step might be to disable Log Chat to File under the Chat tab – as each client will make chat log files. This may clear up the last bit of avoidable resource usage while multiboxing. There are a number of tools which are commonly used by miners. This section is not a comprehensive how-to guide to each tool, but it provides a link to the site for the main publically available tools, where you can find further information and decide for yourself whether it suits your particular needs. 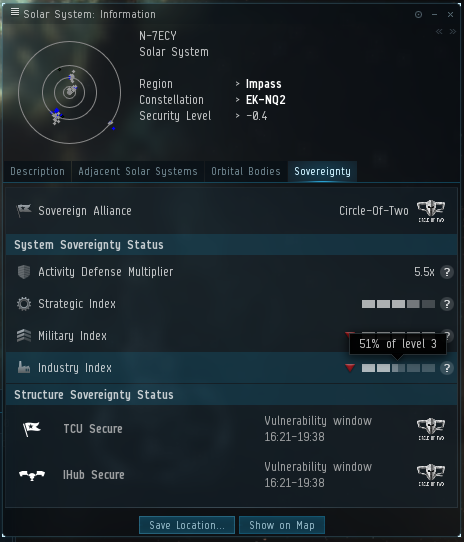 Nullsec alliances and Wormhole groups may further have their own private tools which are only used inside their organisations. Eve IPH – Eve Isk Per Hour is a comprehensive industry program that can help you calculate all the required materials for a given blueprint, bonuses for building, time it takes to mine based on skills and boosts, refining bonuses, as well as help plan out construction plans and shopping lists. It does this as well as helps players measure how profitable what they choose to do could be. Eve Industry – Eve Industry assists in calculating what is required to build things based on blueprints. Fuzzworks calculators – Fuzzworks has a bunch of different tools related to industry that can be useful. Eve-Calculator Mining – Calculates what to mine based on profitability. Pirates Little Helper – useful killboard analysis to see quickly what a player does in game. Near2 – Intel parcer that gives audio notifications when intel is reported about systems close to where you are. Gank Intel – shows active gankers based on recent killboard activity. Pyfa – useful for planning out ship fittings and personalizing fittings based on skill level. Isboxer – Premium multiboxing tool that can assist in large multiboxing setups. Eve-O Preview – Free multiboxing tool that can assist with multiboxing setups.